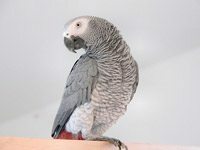 The African Grey Parrot is a medium-sized parrot. Experts regard it as one of the most intelligent birds. They feed primarily on palm nuts, seeds, fruits, leafy matter, and have even been observed eating snails. Their overall gentle nature and their inclination and ability to mimic speech have made them popular pets. 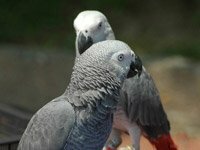 African Grey Parrots have been known to have vocabularies of well over 200 words. In the wild these birds live in flocks of one to two hundred birds. What sound does an African Grey Parrot make? 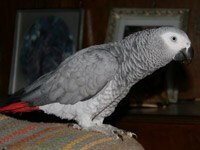 Wild African Grey Parrots frequently whistle, shriek, squeak, and click. 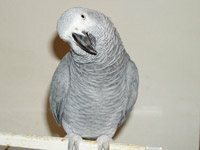 How does an African grey parrot hear? Like all birds African grey parrots have a slighter darker patch diagonal to their eye, what we call cheeks. If you hold back the feathers on the patch you will see a hole that is the ear. The lifespan of African grey parrots is 60 years. African Greys are noted for their intelligence. People have been keeping African Greys as pets for over 4,000 years. Greys can have a vocabulary of over 2000 words and can mimic various sounds with amazing accuracy. African Greys have the intellectual capacity of a 5 year old child. 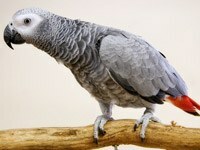 Like all parrots, African Greys require frequent attention, various toys, a large cage and a stimulating environment. 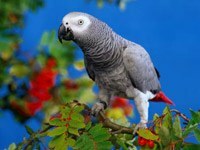 Download free African Grey Parrot wallpapers, click on the image to open the large version. Print free African Grey Parrot coloring pages, click on the image to open the large version.